Scleral contact lenses are large-diameter gas permeable (GP) contact lenses that rest on the sclera (white of the eye) and not directly on the cornea. They contain silicone that is oxygen permeable, so oxygen can pass through the lens giving greater comfort and better eye health. Scleral lenses can also provide clearer vision, durability, deposit resistance and can be easier to clean. Are scleral lenses comfortable to wear? Yes, because they rest on the sclera which is a lot less sensitive the the cornea. It may take between 5 to 10 days before they settle in completely. Scleral lenses provide initial comfort similar to soft lenses, especially for sensitive eyes or irregularly shaped corneas. Because of their size, scleral lenses are more stable on the eye than conventional GP lenses, so they are less likely to accidentally dislodge from the eye. This stability also can make them more comfortable than conventional GP lenses. 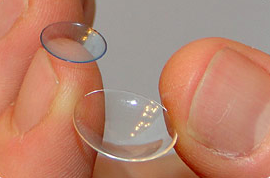 Scleral lenses are larger than GP conventional lenses. They are called “scleral” lenses because, instead of covering only a portion of the cornea (like conventional GP lenses), these large lenses vault over the entire corneal surface and rest on the “white” of the eye (the sclera). How do scleral contact lenses correct distorted vision? If you have had previous eye surgery/trauma or have a condition called Keratoconus then your cornea may be irregular in shape. A scleral lens vaults right over the top of your cornea to provide a new clear, regular surface for the light to refract on. Between the back surface of the scleral lens and your eye, your tears and moisturising gel fill in any irregularities resulting in clearer vision with reduced glare and haloes. How long will scleral lenses last? Many people who wear scleral lenses are able to wear them for 12-14 hours daily. However some people may need to remove the lenses, clean them, and reapply them with fresh moisturising gel periodically throughout the course of the day in order to maintain the best possible vision and comfort. 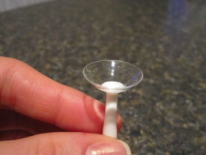 How do I insert my scleral contact lenses? 1) Remove the lens from its case. 3) Fill the lens to the top with TheraTears Gel. If it is not full to the top you might let air bubbles into the lens. 4) Lean over until the face is parallel to the floor, keep both eyes wide open and look straight ahead. 5) Pull back the upper lid with your left thumb or forefinger, make sure to hold right near the eyelashes. Pull the lower eyelid out of the way with your left fourth finger whilst holding the suction holder and lens with your right hand. 6) Apply the lens to the middle of your eye and SQUEEZE the barrel of the suction cup. This will gently force the lens onto the eye. Do not allow any air bubbles to get into the lens. 7) Release your lower lid first, then SLOWLY let go your upper lid and blink. 8)If the lens does not feel comfortable, remove it, clean it and re-insert. Note: The suction holder should be cleaned regularly with your contact lens cleaner rinsed with preserved saline and left to air-dry. How do I remove my scleral contact lenses? 1) Look upwards. Pull down the lower lid with your right index finger so that it is just below the inferior edge of the lens. 2) Pull up the top lid with your left index finger so that it is just above the superior edge of the lens. 3) Push gently but firmly into the sclera (“white” of your eye) through the lid margins so that the suction at the edge of the lens is broken and a large air bubble is introduced into the post-lens tear layer. 4) The lens can then be lifted off the eye. Note: It is normal for the eye to feel slightly dry following lens removal. This should only last for 5 minutes. Lubricants can help. It is also normal to see some reflex conjunctival redness for a few minutes, with the presence of an edge compression ring on the conjunctive similar to a tight soft lens. This will also resolve in a few minutes. If this lasts for more than 30 minutes please let us know. Wash your hands with soap and running water, remembering to rinse your hands thoroughly. Dry your hands with a towel. Ensure your nails are clean and not too long. It is important to clean your scleral contact lenses daily to maintain the highest standards of comfort and visual clarity. Each day after you remove your lenses, you must digitally clean them prior to overnight storage. 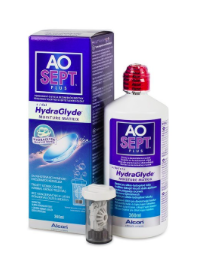 5) Never rinse lenses with AOSept prior to insertion into the eye. Solution must be neutralised. 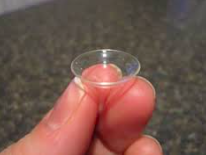 Bacteria can accumulate in contact lens cases. 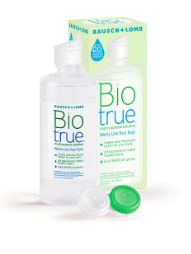 After putting in your contact lenses, the case should always be emptied and air-dried.. A new contact lens cases is included with every purchase of contact lens cleaning solution so you should throw away the old case and use the new one. In most cases you should remove scleral lenses before sleeping. 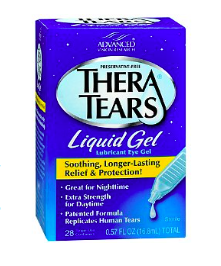 Stagnation of the tear layer behind the lens could lead to a higher risk of eye infection. Since most of the people who need scleral lenses have already had some trouble with their eyes, further challenge to the surface of the eye would not be advisable. The humidity in aircraft cabins is very low. If you wear your contact lenses they will become very dry and uncomfortable and you will arrive at your destination with sore eyes. Please wear your spectacles for flying if at all possible. Ideally insert your contact lenses just after arriving at your destination. Now you need to carefully examine the edge of the lens in bright light. You might notice a small chip out of the edge of the lens. The lens would need to be replaced so please contact us. We normally like to see you about 1-4 weeks after picking up your lenses and then again at 3 months, 6 months and at least every 6-12 months thereafter. This is so we can review the health of your eyes and suggest any improvements in your contact lens prescription, lens design or material. If you do not return for regular after-care checks, we are legally unable to supply you with contact lenses, as they are a health appliance. Always wear your contact lenses to your contact lens appointments, having had them in for at least 4 hours. Please remember to bring your case and spectacles with you. Please note, all prices are subject to change at any time. You have 3 months to change the parameters until we find the perfect fitting for your eyes. We offer a 50% store credit if lens is unsuccessful and the lenses are returned to us. Sorry, we do not provide warranty for loss of lenses. We can give a 50% refund on scleral contact lenses. Please note we do not give refunds on fitting fees. Please see our office policy or speak to your optometrist for further details.